-->Nordic style, cook for casserole, soup, rice. -->It is suitable for 2-4 people. (1)Use on open fire or gas stove. (3)Practical & decent gift to your intimates on holidays. Products sent to Amazon Warehouse are 100% inspected,use Fulfilled By Amazon delivery;If you receive the product damaged,please directly go to Returns Center Page for a request. 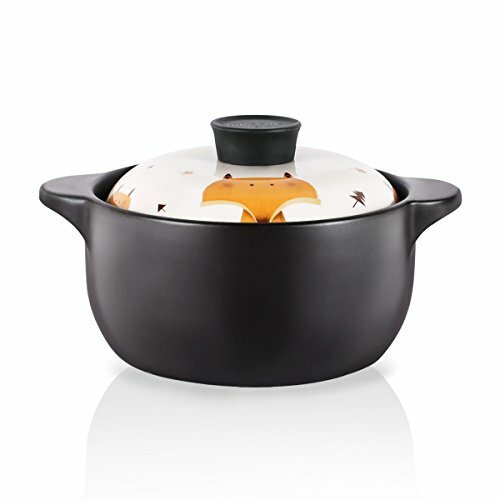 2.6-Quart nordic style caremic casseroles with black dish, white cartoon lid. Specially designed: Anti-hot bakelite lid top beads and durable stoneware material designed. Cook for casserole, soup, rice, it is suitable for 2-4 people. Including 4 patterns: uncle, girl, fox and brown bear. Packaged with elegant box, Ready for gift giving!